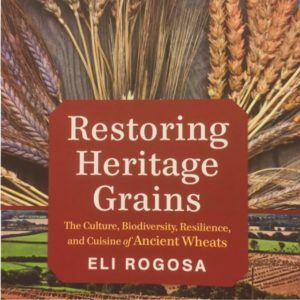 Restoring Heritage Grains is a book about a journey; not only of wheat but of the author. Eli Rogosa began working with wheat in Israel where she moved from Maine to find partners for peace through organic farming. While traveling she observed farmers successfully growing a diverse variety of wheat without external inputs and saving seeds from the varieties and plants that performed the best under the growing conditions. This was the beginning of her quest to bring landrace wheat back from the brink of extinction and this book details her quest. A treasure trove of information, it is filled with the history of the cultivation of wheat; the diversity of the cultivars; the cultural folklore surrounding its cultivation; a ‘how to’ for growing heritage wheat; and finally using the cultivars. It is also a call to all of us to save seeds (not only wheat); to discover what grows best for us and select for traits that we want. The first chapter deals with wheat and its evolution since it was first wild-gathered over 23.000 years ago and cultivated over 12,000 years ago; to present day where profit is the overriding goal rather than nutrition. And, when you consider co-evolution, here is a grain that has evolved over thousands of years with the people who cultivate and ingest it and in the twentieth and twenty-first century it has become toxic to a percentage of those people. Thus the issue of gluten intolerance and wheat allergies is introduced in this chapter and later in an appendix. Chapter 2 introduces how Rugosa made her way to the Middle East, the people involved in maintaining gene banks and delineates what Landrace varieties are. That is followed by a detailed, yet simplified, overview of the different types of wheat based on their chromosome numbers and then by a description (including legends) of the 14 hulled and free-threshing wheat varieties found in Colchis (present day Georgia). But I like pictures and photographs of each variety along with description would have been extremely useful to me. There are a few color photos of the wheat (and other things too, like yummy recipes) included in the center section. The last section of this chapter deals with seed saving and how to produce new, improved (flavor, nutrition, yield, disease resistance) landraces by selective breeding. This is interspersed with a discussion of the problems of modern day wheat varieties. For those interested in the cultivation of landrace wheat, the next chapter discusses that in detail. I have grown wheat, on and off, for almost 40 years. Our first adventure was to produce enough to supply us with baby food for our growing family. (We planted 4 pounds of wheat and after all the work, ended up with 6 pounds of clean grain; not an auspicious start.) After that I grew it for dried arrangements and for sale at the farmers’ market. It is a lot of work to grow, harvest, dry, clean, bundle and sell a bunch of wheat. It was at that time that I discovered weaving straw into decorative figures associated with traditional harvest festivals (read value added initially but growing into fascination). But learning how to grow the grain was not as easy. I depended on Gene Lodgson’s excellent 1977 book, Small-Scale Grain Raising, which was geared more to larger scale growers. Eli describes a way to grow heritage varieties. When we began, we broadcast the seed; then I planted it 1-2” apart in rows 6” apart in a 4’ bed. After visiting Eli and seeing her wheat trials and communicating with Sylvia Davatz of Solstice Seeds, I began growing the wheat in much more space (still in 4’ beds with 6” between rows but 12” between plants). I’ve grown a large variety of wheat cultivars garnered from wheat weavers from Switzerland, to Illinois, to England, to North Dakota. And giving them more space definitely increased the number of tillers (stalks from a plant) and added to its ability not to lodge (fall over in wind and rain). I don’t under sow my wheat with clover because I weed early and often and don’t have any other equipment except a hoe for cultivation (and a partner who expects weedless beds) but can see the benefit. Lodging is one of the factors why modern wheat varieties are bred to have shorter stalks. Another factor is we don’t use straw as much as we did for mulch and bedding; and, in the past for floor mats, bedding, insulation, mattresses, as fabric alone and in combination with other fibers, and don’t forget straw hats. And for me, a straw weaver, that is one of the most important assets of heritage wheat. While new varieties may be a foot tall, heritage varieties can stand 6’ tall with first stems of over 3’ and those make for great weaving and spinning long straw threads (that elf in the fairy tale Rumpelstiltskin wasn’t the only one to spin straw into gold, well golden threads) and the second and third stems (between the joints) are good for marquetry. And after reading, Eli’s book, I realized, I have produced my own landrace. This year the Turkey Red I grew from seed that had been planted alongside all my other varieties over the years had a large proportion of taller, more robust plants with a beautiful burgundy color on the stems. These seeds were selected as I do each year from what I considered the ‘most desirable’ for weaving and are derived from seeds that I have been selecting and saving for the last 12 years. I may call my ‘new’ variety ‘Royalston Red’ (just kidding). But, it is so satisfying — a kind of seed to weaving, akin to sheep to shawl. I highly recommend it. The next chapter, “The Journey of the Sheaves,” is a historical travelogue filled with folktales that blossomed around and followed the cultivation of wheat. It is an epic journey and tale. I love this as it fits with the stories that surround the traditional designs that I weave with the stalks of wheat. Eli discusses the different varieties and cultures that make this grain universal. The last chapter is a wide range of einkorn recipes: beer, sprouted grains, fermented grains, sourdough, salads, entrees, and a wide variety of breads and baked goods. Eli’s wheat of choice is einkorn and that is her expertise in cooking. As this is a book about a variety of heritage wheat, I would have liked some recipes using different varieties or adaptations to accommodate other varieties, such as using blau emmer for farro and a durum for pasta. Still, there are a diverse offering of recipes. Following that are two appendices and a list of resources: the first appendix is on baker’s formulas and the second on why modern wheat is making people sick. I’ll not discuss either. You can seek out the book and discover the answers yourself. Rogosa’s book is one of the few books on wheat cultivation (besides textbooks) and a must-have for anyone interested in wheat. With its scope of the history of wheat cultivation and cultivars, the extensive and diverse discussion of folklore and cultural history, growing methodology, and recipes, it is a mini-encyclopedia of all things wheat.